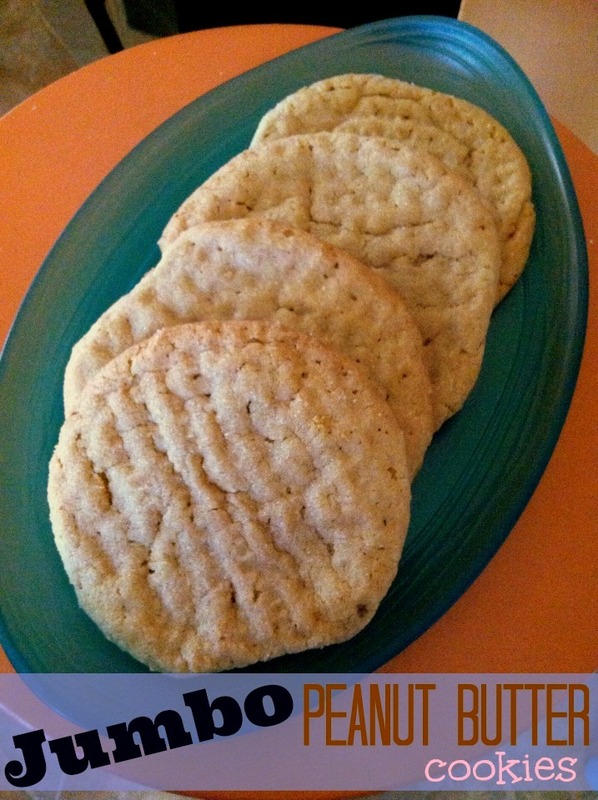 Are you ready for the most moist, chewy, jumbo, delicious peanut butter cookie that you will ever have? 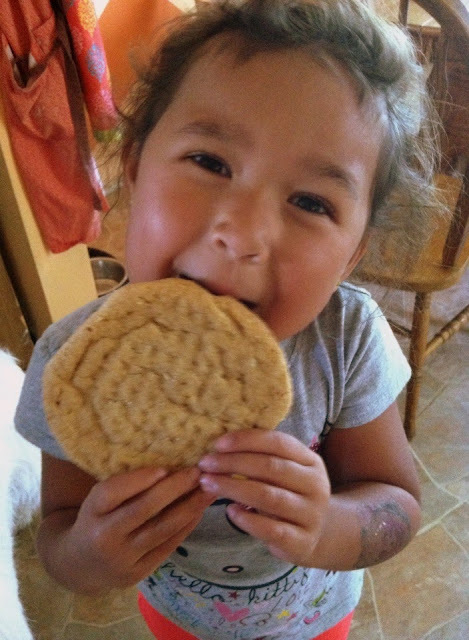 I am positive that I have mentioned in one of my chocolate chip cookie posts that my daughter doesn't like chocolate chip cookies. I really just assume that they are every one's favorite, but after baking so many batches of cookies that I can't even count them anymore...I have learned people really love a variety of cookies. Peanut butter happens to be my daughter's preference. So I have been trying all kind of peanut butter cookie recipes trying to find "her favorite". Well it turns out that this is now the hubby's favorite cookie. I made them, and he never, ever, I mean ever tells me if he likes a cookie, or any baked good I make. It's always "it's alright" or "yeah, it's good". But this cookie pushed him so far over the edge that he text me while fishing to tell me that he ate the two I packed for him to take, and he wants more "because they are the bomb". Yes, I know the phrase is a wee bit outdated, but it assured me that this is an amazing cookie. This recipe came from Just A Taste and I wish that I could say I was clever enough to have come up with this recipe, I did adapt it a bit. It is my own new favorite! (I know, it changes every time I make something new). I baked them at 325 for about 15-18 minutes a batch. I used 1/4 cup measuring cup to measure out the dough for each cookie. Bake 6 cookies at a time, otherwise they will start to touch, I even had them separated about 2 inches from each other and they touched, I squeezed on 9, so I won't do that again. 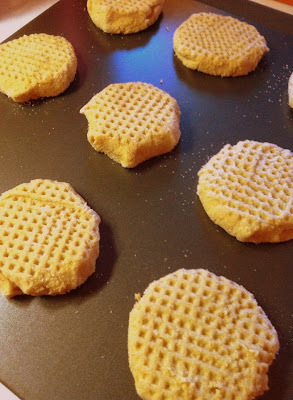 I made exactly 18 cookies with this recipe, and handle the dough as little as possible. The peanut butter melts in your hand, so work swiftly when rolling it in sugar. I just plopped the dough out into my hand, placed it in the sugar and then made it as round as I could while rolling it. DO NOT over bake these. Bake until they don't look doughy in the center any longer. Take out of the oven, leave them on the cookie sheet for another 5-10 minutes so they harden up a bit enough to move them. Then use a spatula large enough to pick up the entire cookie, so it won't crack or break, and move them to a cooling rack to finish cooling. In a large mixer, cream together the butter and peanut butter for a minute or two. Meanwhile, in another bowl mix together the flour, baking soda, and salt. Add the sugars, vanillas and one egg at a time to the butters. Cream together well, it will be gritty. Slowly add the flour to the butter and sugar mixture. Mix just until flour is incorporated. Using 1/4 measuring cup, measure the dough out and roll into the 1/2 cup reserved sugar. 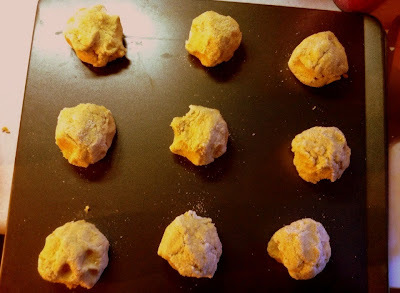 Place sugar rolled dough on cookie sheet. Bake for 15-18 minutes, until golden brown, and center are puffy. Let rest on cookie sheet for 5-10 minutes then remove cookies from sheet and place on cooling racks.